Flydubai Flight 981 was a scheduled international passenger flight that crashed during an aborted landing at Rostov-on-Don Airport, Russia, on 19 March 2016, resulting in the deaths of all 62 passengers and crew on board. The flight, operated with a Boeing 737-800 aircraft, had originated from Dubai International Airport, in the United Arab Emirates. The weather at Rostov was poor at the time. Flight 981 aborted its first landing attempt and went into a holding pattern for nearly two hours before making a second landing attempt. After aborting the second attempt, the aircraft climbed sharply then descended rapidly and crashed onto the runway. Flydubai is an Emirati state-owned low-cost carrier, with its hub in Dubai. Its chairman, Sheikh Ahmed bin Saeed Al Maktoum, is also the chairman of Dubai-based Emirates. Flydubai was founded and commenced operations in 2009 and continued rapidly expanded; by end of 2015, it flew to over 100 destinations, including 11 in Russia. Its entire fleet consisted of Boeing 737-800s at that time. Flydubai launched its Rostov-on-Don service in September 2013 with two scheduled flights per week. The airline had no previous fatal accidents before and had an "excellent safety record". In 2015, Flydubai passed the safety audit of the IATA, and several days before the crash had become an official member of the organisation. In the aftermath of the crash, Flydubai pilots raised concerns about rostering-related fatigue. A pilot told the BBC on a condition of anonymity that staff had insufficient time to rest between shifts. The pilot shared their concern with a senior member of the staff, who replied that "we don't have a fatigue issue at Flydubai." Another employee said it was their belief that, of the 25 active pilots (out of a total of 600) who resigned from the airline in 2016, most had done so because of "fatigue, rosters and quality of life." It was the opinion of some of those pilots that an accident was inevitable. In response to the allegations, Flydubai told the BBC, "we are unable to disclose confidential information relating to our employees." A6-FDN at Dubai International Airport in 2011. The aircraft involved was a five-year-old Boeing 737-800, registered as A6-FDN, MSN 40241, powered by two CFM International CFM56 engines. Its first flight was on 21 December 2010, and it was delivered to Flydubai on 24 January 2011. The aircraft had passed a C-grade maintenance check on 21 January 2016. Flight 981 carried enough fuel for 8.5 hours of flight; it had been flying for six hours prior to the crash. The captain was 38-year-old Aristos Sokratous, from Cyprus. He had over 6,000 hours of total flying time. Sokratous was promoted to captain a year and a half before the crash. At the time of the crash, he had intended to quit the airline after accepting a job from Ryanair, which would allow him to be based with his family in Cyprus. His wife was due to give birth to their first child a few weeks after the crash. According to several Flydubai staff members, Sokratous decided to leave the airline mainly because of fatigue and lifestyle issues. The first officer, 37-year-old Alejandro Cruz Álava, was Spanish. He had more than 5,700 hours of flying time. He started flying with Flydubai in 2013, two years before the crash, and had previously flown two regional airlines in the Spanish Canary Islands – Binter and Naysa – before joining the airline. Both pilots had experience in landing at Rostov-on-Don. The meteorological conditions in Rostov-on-Don airport were described as "adverse". The cloud base was at 630 m (2,070 ft), with light rain showers and a haze. The wind velocity was 13 m/s (29 mph), gusting to 18 m/s (40 mph), from 230 degrees, with severe turbulence and moderate wind shear on the final approach course. Flight 981 was scheduled to depart from Dubai International Airport at 21:45 Gulf Standard Time (UTC+4) on 18 March 2016 and arrive at Rostov-on-Don Airport at 01:20 Moscow Standard Time (UTC+3) the next day. It departed from Dubai after a 35-minute delay, at 22:20 GST. The return flight from Rostov-on-Don was scheduled to depart at 02:20 MST. By the time that Flight 981 arrived at the initial fix, to begin the approach to Rostov-on-Don, two other flights had landed successfully during the previous 20 minutes. An alert from Flight 981's onboard windshear warning system caused the pilots to abandon their first approach to a landing. Following that first missed approach, the flight entered a holding pattern near the airport for the next two hours, awaiting improvement to the weather conditions. While holding, Aeroflot Flight 1166 made three unsuccessful attempts to land and then diverted to nearby Krasnodar Airport, landing there at 02:59. At 03:28, the crew began their second approach to runway 22, but again aborted their landing. The plane then rapidly climbed to 4,000 feet (1,200 m) before going into a 45 degree dive, and at 03:42 crashed onto the runway not far from the threshold, skidding a few meters and exploding. All 62 people on board, 55 passengers and 7 crew members, died in the crash. Of the passengers, 44 (including four children) were Russian citizens. Eight other passengers came from Ukraine, two from India and one from Uzbekistan. Thirty of the passengers were tourists on a package tour from Natalie Tours, one of the largest Russian tour operators. A NASA animation depicting an aircraft's elevator pitch. On the day of the crash, an investigative commission was established by the Interstate Aviation Committee (IAC) to determine the circumstances and causes of the crash. 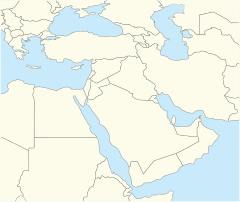 The investigation is led by Russian air accident investigators, and includes representatives of the aviation authorities of the United Arab Emirates (the state of the aircraft's registration and operator), the United States (where the aircraft's designer and manufacturer is headquartered) and France (where the aircraft's engines were designed). The U.S. team consists of air accident investigators from the National Transportation Safety Board (NTSB), experts from Boeing and representatives of the Federal Aviation Administration (FAA). The Russian Investigative Committee opened a criminal investigation into any possible safety violations leading to the crash, and allocated more than 50 investigators to work on the case. In a statement, it listed "crew error, technical failure, adverse weather conditions and other factors" as possible reasons for the crash. Terrorism was ruled out as a possibility as no traces of explosives were found. On 20 March, investigators completed a survey of the wreckage. Russian and Emirati experts started an analysis of the radar data, flight crew–ATC communications and meteorological information. Both flight recorders were recovered from the crash site and delivered to the Interstate Aviation Committee in Moscow. On 20 and 21 March, investigators from Russia, the United Arab Emirates (UAE) and France, extracted the memory modules from their protective casings and downloaded the data from both the flight data recorder (FDR) and the cockpit voice recorder (CVR). Both recorders functioned normally until the time of impact. While their outer casings sustained some damage, the quality of both recordings was good. A transcript of the communication between the Captain and First Officer was prepared, as the data was analyzed. They also began synchronizing information from the flight recorders, ATC data and meteorological information. On 21 March investigators in Rostov-on-Don finished collecting debris from the crash site and started reconstructing the fuselage layout in a hangar. Another group of investigators, based in Moscow, together with Emirati investigators, airline representatives and experts from Cyprus and Spain, started to collect and analyse materials on the aircraft's airworthiness, Flight 981's preparation before departure, and the training of its flight crew. On 23 March, Russian and foreign investigators began to test the Rostov Airport's radio communication equipment, examine ATC communications with other flight crews before the crash and evaluate the actions of the ATC and the airport's meteorological services. Using data retrieved from the flight recorders, as well as information from the aircraft maintenance log and flight documentation, the investigators began to analyse the operation of all Flight 981's aircraft systems, including the flight control system and engines, and also analyze the actions and state of the flight crew during the entire flight. On 29 March the IAC announced that preliminary analysis of information from the flight recorders showed no failures of any aircraft systems, engines or other components had been discovered to date. The airworthiness certificate was valid, all necessary maintenance history was in good order at the time of departure. A transcript of more than two hours of the last crew communications was prepared but was not released to the press as international and Russian rules of air crash investigation forbid publication. The IAC requested Boeing provide technical documentation to aid in assessment of the aircraft's system operations and about all similar previous incidents with Boeing airframes. In August 2018, the IAC began reconstructing data from the head-up display (HUD) system. Both approaches were conducted in flight director mode, with the autopilot and autothrottles disengaged. There were no significant heading or altitude deviations from the prescribed approach course. At 22:42, while conducting the first approach, the crew elected to abort and initiate a go-around procedure, in response to an alert from the on-board windshear warning system. They climbed to 5000ft (1500 m) and then to 8000ft (2450 m) to hold. While in that holding pattern, the crew reported moderate icing and requested further climb to FL 150 (4550 m), where they held until descending again for a second approach attempt. During the second approach, the crew again aborted and initiated another go around at a height of 220 meters and a distance of 4.5 km from the runway threshold. The vertical speed during that second go-around went as high as 20 m/s, while engine thrust was set at the maximum TOGA limit of 101 – 102% (N1). The second go-around decision was probably provoked by a sudden 20-knot increase of indicated speed to as much as 176 knots within 3 seconds, which could have been an indication of a windshear. During the second go-around, flaps were set at 15° and the landing gear was retracted. At 1900 ft (approx. 600 m) the nose up pitch angle reached 18°. The pilot flying pushed the control column forward, causing the vertical acceleration to decrease, while the forward speed increased to over 200 knots, which caused an automatic retraction of flaps from 15° to 10°. A short-term reduction of engine thrust followed within 3 seconds, resulting in decreasing speed which triggered an automatic extension of the flaps back to 15°. The crew then intervened, again setting maximum TOGA thrust, which caused another automatic flaps retraction, back to 10°, where they remained until the impact. The pilot flying then pulled back on the control column, which increased the vertical speed to as much as 16 m/s. At a height of 900 m, there was a simultaneous control column nose down input and a trimming of the horizonal stabilizer to a nose down position, from -2.5 deg (6.5 units) to +2.5 deg (1.5 units). The FDR recorded that nose down stabilizer trimming, from the stabilizer trim switches on the control wheel, lasting 12 seconds. The CVR also recorded the specific noise of rotation of the trim wheels, located on both sides of the central pedestal. The result was that after the aircraft climbed to about 1000 m, it then began a rapid descent with negative vertical acceleration of -1g. The subsequent crew attempts to recover were not sufficient to avoid an impact with the ground. At 00:41:49, the aircraft hit the runway approximately 120 m from the threshold with a speed of over 600 km/h and a nose down pitch exceeding 50 degrees. The impact totally destroyed the aircraft, instantly killing all on board. As of January 2019, the IAC has yet to release their final report of the crash. In light of the disaster, the Governor of Rostov Oblast, Vasily Golubev, announced that the government would pay 1 million rubles (about 15,000 USD) to the families of the victims. The day after the crash, 20 March, was designated as a day of mourning in the region. On 21 March Flydubai opened a Family Assistance Centre for the families of the victims in Rostov-on-Don. It announced a payment of 20,000 USD per passenger for the "immediate financial needs" of their families. The airline resumed regular flights to Rostov as soon as the airport reopened after the crash, but assigned a different flight number for it. In a press conference, the airline's CEO, Ghaith Al Ghaith, informed Emirati journalists that specialists from the engineering, safety, and security departments of Flydubai are working closely on the ground with the Russian investigators. He asked the media to refrain from speculation and "give the investigators time to do their job and come out with results". Five days after the crash, on 24 March, the Crown Prince of Abu Dhabi Mohammed bin Zayed Al Nahyan went to Moscow to discuss the course of the crash investigation with Russian President Vladimir Putin. Aviation experts in Russia pointed out multiple similarities between Flight 981 and Tatarstan Airlines Flight 363. In both cases, a Boeing 737 impacted the airfield at a high vertical speed while attempting a go-around. The Flight 363 investigation, conducted by the Interstate Aviation Committee, ruled that the 2013 accident was the result of pilot error; one dissenting commission member, a Rosaviatsiya representative, filed an alternative opinion report, claiming the commission ignored a possible mechanical malfunction of the Boeing 737's elevator controls. On 28 March, Artyom Kiryanov, a Russian Civic Chamber member, called for Russia's Federal Air Transport Agency and the IAC to suspend the flying certificates of all Russian-owned and -operated Boeing 737 Classics and Next Generation series, until the end of the Flight 981 investigation – citing concerns about the elevator controls in all 737s. After this news reached the U.S., the Boeing company's stock went down 0.81% on the New York Stock Exchange. On 12 April, the American law firm Ribbeck Law, on behalf of several relatives of the victims, filed a lawsuit against Boeing in the Circuit Court of Cook County in Chicago, pursuing financial compensation of 5 million USD per passenger on the flight. ^ a b c "Interim Report A6-FDN" (PDF). Interstate Aviation Committee. 20 April 2016. Archived from the original (PDF) on 23 April 2016. Retrieved 20 April 2016. ^ "Rostov-On-Don Airport in Russia". Sputnik News. 19 March 2016. Retrieved 19 March 2016. ^ a b "Playback of FlyDubai flight FZ981". Flightradar24. Retrieved 29 March 2016. ^ "How An Illusion Made Pilots Crash Their Plane". 25 April 2016. Retrieved 25 December 2016. ^ a b Cornwell, Alexander (21 March 2016). "Flydubai to resume flights to Rostov-on-Don on Tuesday". Gulf News. Dubai. Retrieved 22 March 2016. ^ Jain, Shweta (21 March 2016). "Flydubai Russia expansion plans may be affected by crash of flight FZ981". Gulf News. Dubai. Retrieved 23 March 2016. ^ "Flydubai becomes latest IATA member from MENA". Arab News. Jeddah. 12 March 2016. Retrieved 25 March 2016. ^ a b Fottrell, Stephen (24 March 2016). "FlyDubai crash pilot 'was due to leave job over fatigue'". BBC World Service. Retrieved 24 March 2016. ^ a b "Boeing 737 Next Gen MSN 40241". Airfleets.net. Retrieved 19 March 2016. ^ a b c d Chance, Matthew; Cullinane, Susannah; Meilhan, Pierre (19 March 2016). "Flydubai plane crashes in Russia; 62 aboard reported dead". CNN. Retrieved 19 March 2016. ^ a b Hradecky, Simon (19 March 2016). "Crash: Flydubai B738 at Rostov on Don on Mar 19th 2016, struck wing onto runway after holding for 2 hours". Aviation Herald. Retrieved 19 March 2016. ^ a b c Hadjicostis, Menelaos (19 March 2016). "Cyprus Pilot of Crashed FlyDubai Jet Had a New Job Elsewhere". Associated Press. Retrieved 8 April 2016. 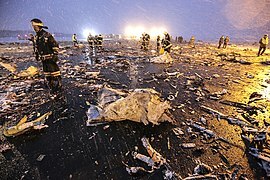 ^ a b "Flydubai plane crash: airline to give victims' families $20,000 each". Gulf News. Dubai. 19 March 2016. Retrieved 19 March 2016. ^ Long, Natalie (19 March 2016). "Flydubai plane crash pilot, co-pilot leave behind pregnant wives". Gulf News. Dubai. Retrieved 19 March 2016. ^ a b c "Updated list of passengers and crew members of flight 981 – Dubai – Rostov-on-Don". Ministry of Emergency Situations. 19 March 2016. Retrieved 19 March 2016. ^ Long, Natalie (19 March 2016). "Flydubai plane crash: Two Spaniards were from Canary Islands". Gulf News. Dubai. Retrieved 19 March 2016. ^ Cornwell, Alexander (20 March 2016). "Flydubai chief executive: 'Airport was good enough to land'". Gulf News. Dubai. Retrieved 20 March 2016. ^ a b c d e f g h i j "Boieng 737-800 А6-FDN 19.03.2016". Interstate Aviation Committee. Retrieved 21 April 2016. ^ "Flydubai flight FZ 981: Dubai – Rostov". FlightMapper. Retrieved 19 March 2016. ^ a b "Statement relating to Flydubai FZ981". Flydubai. 19 March 2016. Archived from the original on 19 March 2016. Retrieved 19 March 2016. ^ a b c d "ASN Aircraft accident Boeing 737-8KN A6-FDN Rostov Airport (ROV)". Aviation Safety Network. Retrieved 19 March 2016. ^ a b "Струйное течение, полупустой самолет. Основные версии причин авиакатастрофы в Ростове-на-Дону" [Jet stream, half-empty aircraft. Main versions of the plane crash in Rostov-on-Don]. Meduza (in Russian). 19 March 2016. Retrieved 19 March 2016. ^ "Aeroflot flight SU1166". Flightradar24. Retrieved 19 March 2016. ^ "Происшествие с самолетом Боинг в г.Ростове-н/Д" [Incident with Boeing aircraft in Rostov-on-Don] (in Russian). Rostov-on-Don branch of the Ministry of Emergency Situations. 19 March 2016. Retrieved 19 March 2016. ^ "FZ981 Flight Manifest" (PDF). Flydubai. 22 March 2016. Archived from the original (pdf) on 2016-04-01. Retrieved 23 March 2016. ^ "Statement relating to Flydubai flight FZ981". Flydubai. 19 March 2016. Archived from the original on 2016-03-20. Retrieved 19 March 2016. ^ "US Transport Agency Sending Team to Russia to Assist in Boeing Crash Probe". Sputnik. 19 March 2016. Retrieved 20 March 2016. ^ Roth, Andrew (19 March 2016). "Dubai passenger jet crashes in Russia, killing 62". The Washington Post. Retrieved 19 March 2016. ^ a b Nechepurenko, Ivan (19 March 2016). "Wind Given as Possible Cause of Fatal Plane Crash in Russia". The New York Times. Retrieved 19 March 2016. ^ "Вероятность теракта на борту разбившегося в Ростове самолета практически исключена" (in Russian). Interfax. 19 March 2016. Retrieved 24 March 2016. ^ Kaminski-Morrow, David (2018-08-21). "Flydubai crash probe trying to reconstruct head-up display data". Flightglobal.com. Retrieved 2018-12-07. ^ "Boeing 737-800 А6-FDN 19.03.2016". mak-iac.org. Retrieved 2018-09-06. ^ "Confirmation of opening of Family Assistance Centre". Flydubai. 21 March 2016. Archived from the original on 2016-03-31. Retrieved 22 March 2016. ^ "Statement relating to flydubai flight FZ981". Flydubai. 20 March 2016. Archived from the original on 20 March 2016. Retrieved 20 March 2016. ^ Westall, Sylvia (20 March 2016). "Flydubai Says No Change to Flights After Russia Crash". The New York Times. Reuters. Retrieved 25 March 2016. ^ a b Rahman, Mujeeb (21 March 2016). "Flydubai rejects rumours, says flight operations normal". AMEinfo. Abu Dhabi. Archived from the original on 22 March 2016. Retrieved 23 March 2016. ^ "Putin, Abu Dhabi prince to discuss investigation of FlyDubai aircraft in south Russia". TASS. 24 March 2016. Retrieved 25 March 2016. ^ Bozhieva, Olga (22 March 2016). "Катастрофа Boeing: эксперты оценили версию заклинивания руля высоты". Moskovskij Komsomolets (in Russian). Retrieved 28 March 2016. ^ Studenikin, Nikolay. "Особое мнение представителя Росавиации" [Alternative opinion of the Rosaviatsiya representative] (pdf) (in Russian). Interstate Aviation Committee. Retrieved 27 March 2016. ^ Loria, Elena (28 March 2016). "Для Boeing 737 могут закрыть российское небо" [Russian sky could be closed for Boeing 737]. Izvestia (in Russian). Retrieved 31 March 2016. ^ Reyes, Robin (29 March 2016). "Russian Government Official Seeking To Suspend Operations of Boeing 737s in Wake of Flydubai Crash (NYSE:BA)". Sonoran Weekly Review. Belize. Archived from the original on 2016-03-31. Retrieved 31 March 2016. ^ Goryaev, Oleg (13 April 2016). "Компании Boeing напомнили о ростовской авиакатастрофе" [Boeing company was reminded about Rostov air crash]. Kommersant (in Russian). Retrieved 20 April 2016. Wikimedia Commons has media related to Flydubai Flight 981. This page was last edited on 7 April 2019, at 23:35 (UTC).